Corrugated board is the most widely used packaging medium for boxes, divisions and fittings. It provides a rigid, recyclable container with cushioning, puncture-resistance, stackability and has a good printing surface, making it suitable for primary, point-of-sale and transit packaging as well as for display stands. It can be specified with various flute forms and paper grades to suit the application. It can be made moisture resistant, suitable for freezing and cold storage. Most common single wall board is B flute, Double wall board gives a combination of protection, high stacking strength and good print surface. 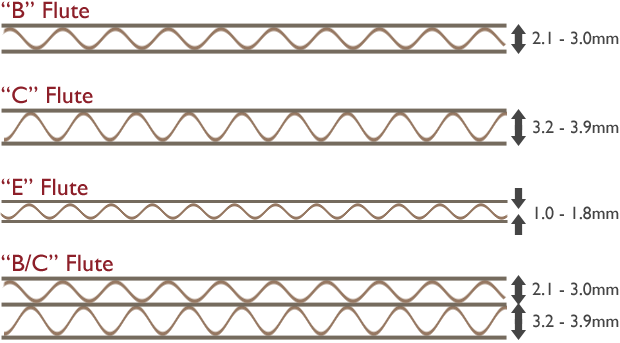 Single wall C flute with heavy liners can be an alternative to Double Wall. E Flute offers an improved print surface and is excellent for small mailer packs. EB flute gives double wall protection.